"Flying rescue animals is really very rewarding." Michael is an animal rescue pilot who started flying planes about five years ago, and began volunteering his talents by flying rescue animals in March of 2015. 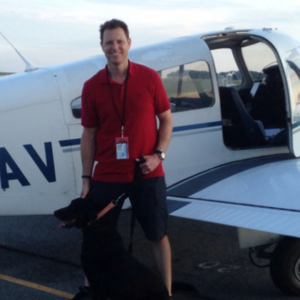 He has completed flights that have taught him how to make things go as smoothly as possible, and one rescue even ended up with a dog adoption by a celebrity! Pilots to the Rescue’s mission is to save potential pets facing euthanasia by flying them to safety using an advanced rescue flight system. Q: If you could be any animal, what would you be and why? Q: What are some supplies that you always bring with you on a flight? Q: Is there a particular flight that stands out to you? “I think one of the very first ones I did, we rescued ditch puppies that came from North Carolina. There was a litter of them and we really loaded up the plane, and it was one of the very first ones I had done so it was very rewarding. I’ve also transported a dog that had Cerebral Palsy and a family ended up fostering that dog. Q: Are there any challenges you have faced? Q: What does a typical flight look like for you? Flying animals is just one of many ways to get involved in animal rescue. A big thank you to Michael and Pilots to the Rescue and all he does to help better the lives of animals. For more information on animal transport and how to get involved, we recommend that you check out https://www.doobert.com/. Doobert is the leading online resource for animal rescue transport and automates the process for the volunteers.